I really wanted to try and test these out so I could provide a review for you, but due to the weather doing what it wants whenever it wants and personal circumstances I haven't been able to test them out successfully. So this is a post just to let you know about the product rather than review it. I do have one left so hopefully I might be able to test that one out soon. I'm ashamed to say that I have been burnt several times in the past, both on my face and body. I think this was a combination of my mum not realising just how easily my skin can burn and me being too young and unaware of how to protect myself properly. Now I'm really quite obsessive about making sure I apply sun protection products if I'm going to be outside for any length of time as I don't want to add to any damage that may have already been done to my skin. 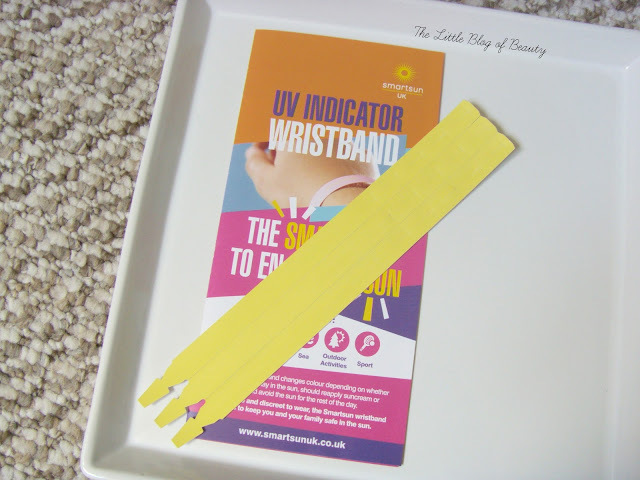 When I was contacted to ask if I'd like to try out the Smartsun UK UV indicator wristbands* I thought it sounded like an interesting and possibly very useful product. The idea of the bands is that you wear one around your wrist and when you apply your sun protection you also apply some to the band. The band starts off yellow and then turns to a beige colour when it's time to reapply your sun protection. It then turns pink to let you know you should stay out of the sun for the rest of the day. The bands are the type that you might be given at theme parks or on holiday if you're all inclusive. One thing I would say about them is that they're almost impossible to put on yourself, it's far easier if somebody else puts it on for you. Both times that I did put one on it took ages, and I'm quite good at putting bracelets on myself, and the first one was pretty mangled by the time I got it fastened. The first time I tried one was on a bike ride we had to abandon because my boyfriends bike broke, and the second time was while I was driving to my in-laws (a three and a half hour journey minimum) but I put it on my gear change wrist rather than the one near the window. So that's why my attempts to test them so far have failed! The time in the car I'm not entirely sure that the band didn't start to change colour because on the guide on the leaflet the yellow and beige colours aren't too dissimilar. So this would be something to keep a close eye on if you do try them. The colour might be obviously different when it does change, it might just be that my band hadn't actually started to change colour at all. I think these bands are great for helping to protect children from the sun if you're spending a day, or even just a few hours out and about. They are of course just as useful for adults because despite being in my 30's now I'm never quite sure when I should be topping up my sun protection. The only issue is they're quite expensive at £4.99 for a pack of just five. If you're on holiday for a couple of weeks in a hot destination you could easily get through a high number of packs if you use them everyday to protect your family. The Smartsun UK UV indicator wristbands are available through the Smartsun UK website and also on Amazon. Do you think UV wristbands are a good idea? Oh wow, I've never heard of anything quite like these but they seem both useful and beneficial. I am someone who takes keen interest in looking after and protecting my skin so these having really intrigued me.